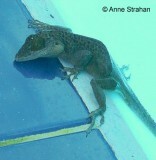 Can you confirm these amateur observations of Anolis leachii? Distribution Barbuda, Antigua and its satellites; introduced on Bermuda. Type locality: “Antilles”; restricted to “St. John’s, Antigua” by LAZELL 1972. Comment Synonymy partly after LAZELL 1972. Anolis leachii has been synonymized with A. alliaceus by Günther 1888.